Perennial. 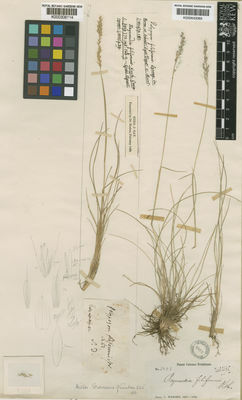 Culms erect, or geniculately ascending; 15-40 cm long. Ligule a ciliate membrane. Leaf-blades filiform. Spikelets comprising 1 basal sterile florets; 1 fertile florets; without rhachilla extension. Spikelets oblong; laterally compressed; 3-4 mm long; falling entire. Glumes reaching apex of florets; firmer than fertile lemma. Lower glume oblong; membranous; 1-keeled; 3 -veined. Lower glume lateral veins ribbed. Lower glume apex dentate; 2 -fid; awned. Upper glume oblong; membranous; 1-keeled; 5 -veined. Upper glume lateral veins ribbed. Upper glume apex dentate; 2 -fid; awned; 1 -awned. Basal sterile florets barren; without significant palea. Lemma of lower sterile floret oblong; membranous; 3 -veined; awned. Fertile lemma elliptic; hyaline; keeled; 1 -veined. Lemma apex acute. Palea absent or minute. Caryopsis with adherent pericarp; oblong; laterally compressed.